OUR EPIC CRICKET KINDNESS MISSION! The Children's Cricket Charity donates masses of cricket equipment and clothing to cricket-loving communities in Australia and the developing Caribbean. In 2019, we hope to expand our goodwill to Sri Lanka too! The Children's Cricket Charity levels the playing field by placing bats, balls, pads, helmets, gloves, stumps, cricket shoes and playing uniforms into the hands of cricket-loving children and teenagers who could never afford gear of their own. Our Kit Recycling initiative has collected staggering quantities of new and gently loved cricket gear over the past three years! WE ARE FUNDRAISING TO FACILITATE DISTRIBUTION & DELIVERY OF STOCKPILED CRICKET GEAR AMMASSED THROUGH CHILDREN'S CRICKET CHARITY COLLECTION INITIATIVES. Community Care Refugee Program, SYDNEY - Chistmas cricket care packages are donated every year to over a hundred chidlren of Sri Lankan refugees aged between 4 and 18 yrs. Jesuit Social Services, SYDNEY for economically disadvantaged families they care for. Backtrack Youth Works, ARMIDALE, NSW for high school aged boys attending their program. We organise Positive Social Impact Coaching Sessions for less fortunate communities. Christmas cricket care packages are packed and donated to social service organisations throughout New South Wales every year for needy children and teenagers. Projects in the developing Caribbean. NOV 2017 - Children's Cricket Charity - Caribbean division shipped a quater of a container to both Antigua & Barbuda, and Barbados. Masses of kit bags were presented to under resourced government schools in disadvantaged communities. 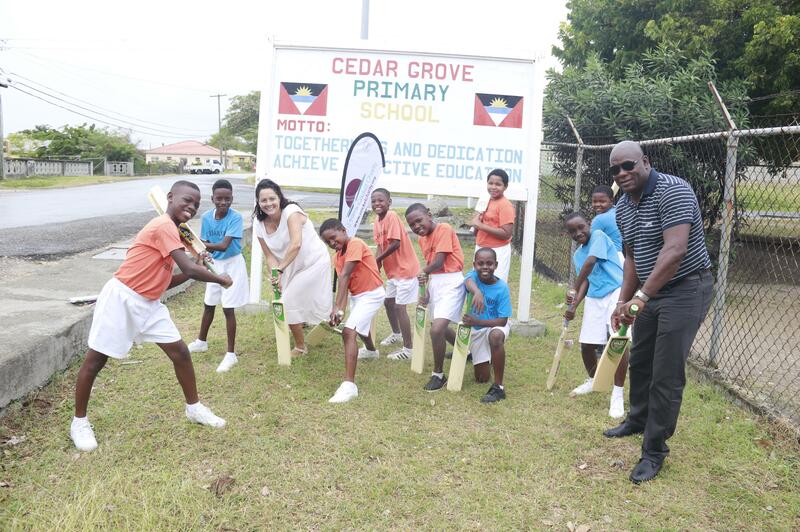 The gratitude from children, principals, government and local cricket bodies is hard to describe such is the shortage of quality equipment in developing Caribbean nations. NOV 2018 - Children's Cricket Charity - Caribbean donated 40 cricket bats and 40 cricket balls to an orphanage in Guyana. The bags were personally transported to Guyana for Children's Cricket Charity by retired Australian cricketers, Melanie Jones and Lisa Sthelakar whilst they were on commentary duties. JAN/FEB 2019 - Chidlren's Cricket Charity - Caribbean delivered a 20-foot container of cricket equipment to St. John's, ANTIGUA consigned to the Ministry of Sports of the Government of Antigua & Barbuda. The BARBUDA council shipped 6 boxes and bags to the goverment primary and secondary school in Barbuda via cargo ferry. ANTIGUA The Government of Antigua & Barbuda through the Ministry of Sports, together with our Antiguan Ambassadors, retired WI cricket legends, Sir Richie Richardson, Ridley Jacobs and Sir Vivian Richards assist in facilitating the work of the Children's Cricket Charity. BARBADOS The Desmond Haynes Foundation, JPHJ Studios, AccessRUs Services, Variety Barbados. Kensington Oval Management Inc and The Barbados Cricket Association assist in faciliating our work. All donations, big and small, make a huge difference. The Children's Cricket Charity is a registered charity with the Australian Charities and Not-for-profit Commission ABN 71 688 378 374. Heatfelt thank you and gratitude for your support.